Shares of RV maker Thor Industries are taking a beating this morning. The stock is off just over 12% following another disappointing earnings report. Today’s sell off has pushed $THO to new 2018 lows as very solid support near the $64.00 area gives way. This major support zone is marked by the 2014 and 2015 highs. 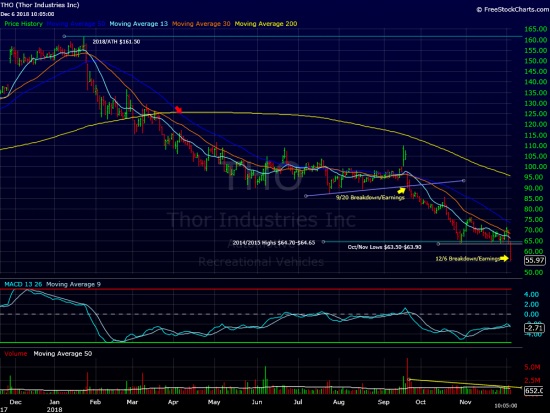 $THO held this level after the last post earnings sell off, but, not this time. $THO has now dropped 64% from its 2018 highs. Since the previous earnings report(9/20)the stock is down 45%. If $THO finishes this month in the red, which looks very likely, it will be the 11 monthly loss over the last 13 months. The longer term MACD indicators(monthly/weekly)have not been this oversold since the 2009 lows. The 2006 high, which held up for just over seven years, is $56.95. We’ll be watching the action closely through year end. We expect more downside before a low risk entry opportunity develops. At time of publication we do not have a position in $THO.